Ready or not, Christmas is next week! I’m kind of ready, kind of. 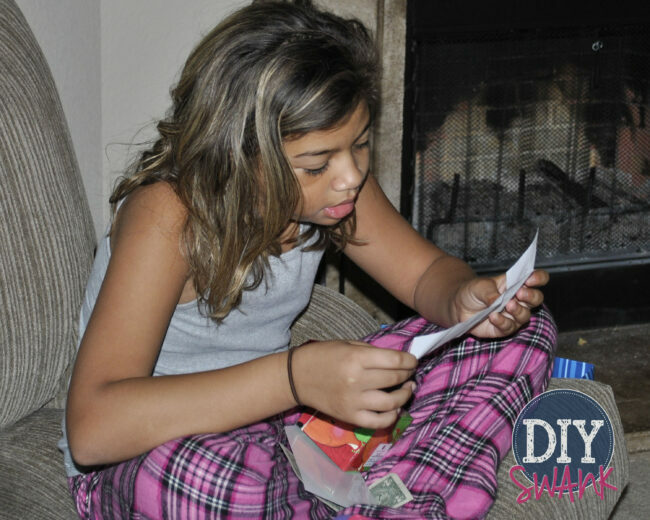 I am sharing with you how Santa made Christmas morning (last year) a little adventure for my kids with a Santa gift scavenger hunt. Yes, Santa sent my kids on a scavenger hunt to find their presents. My older two are at the age where they really don’t believe in Santa. They know the drill, you have to believe to receive. They really didn’t have a long list of gift this year and I was racking my brain on what to get them for Christmas from Santa. I wanted to do something a little different to really get them excited about Christmas morning. So here is how it went-Santa and I are good friends so I had a little talk with him last year. 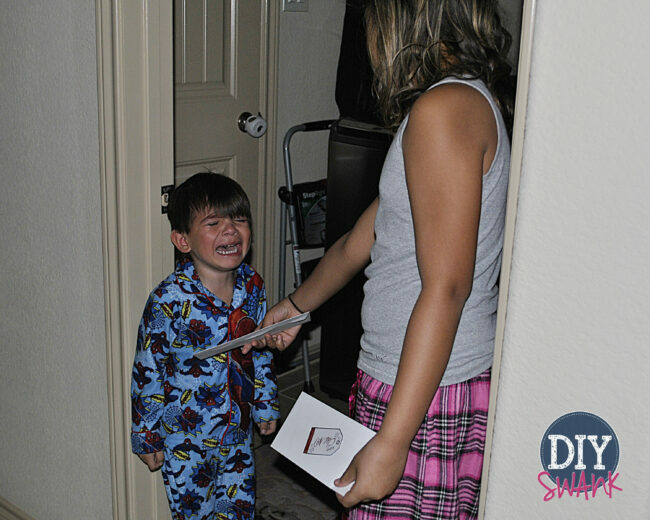 I told him not to bring the kids any junk they didn’t need and to bring cash! He looked at me like I was crazy. Santa didn’t want his elves to get arrested for making counterfeit money! Apparently its not something they make in Santa’s workshop. Who knew? I made a deal with him. I will leave out a stack of $1 bills and you do the work. He agreed! 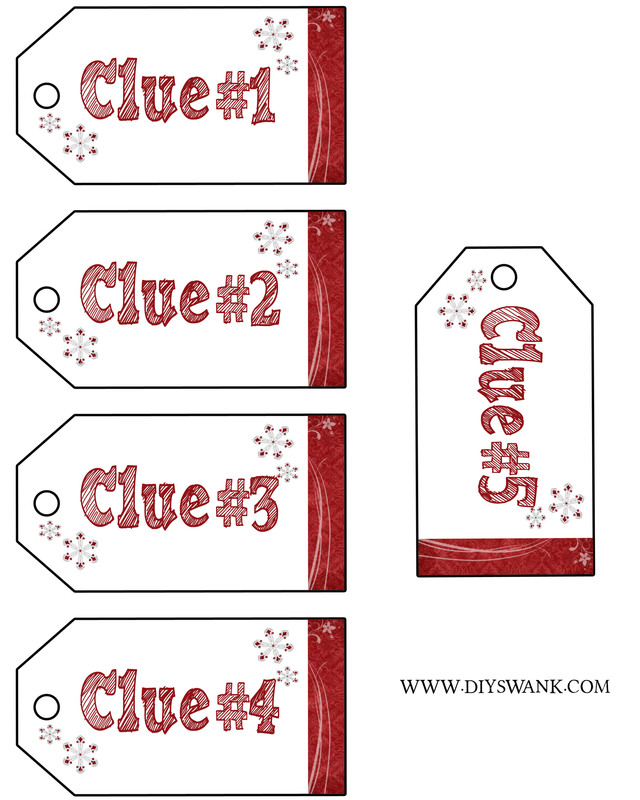 Small or letter size envelopes for each clue. You could use the small gift boxes as well. Santa put a small box under the tree for each kiddo. This is what the box looked like to give you an idea. Santa got one for each kid at the Dollar Tree. The boxes had a tag that had each kids name on it from Santa. 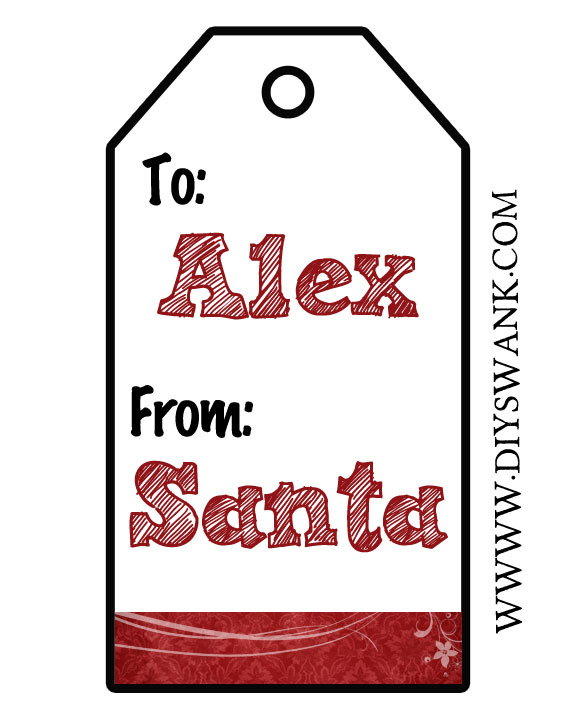 I’ve made a blank tag you Santa can download and hand write the name on each tag to personalize it for each kiddo. Santa also put a dollar in the box. There was a dollar in every clue box. My kids are not morning people and it took them a minute to realize what was going on. Once they realized they had to go find their presents the excitement in the house turned up 10 notches! and we even had a melt down! He was not happy he didn’t find the first clue. Next Santa put each clue in an envelope (like the above picture) hidden in the around the house based on the answers to the clues. The first clue (answer: dryer) thats in the box will start the scavenger and will follow the clues below. They are in word format so you can edit them if needed! 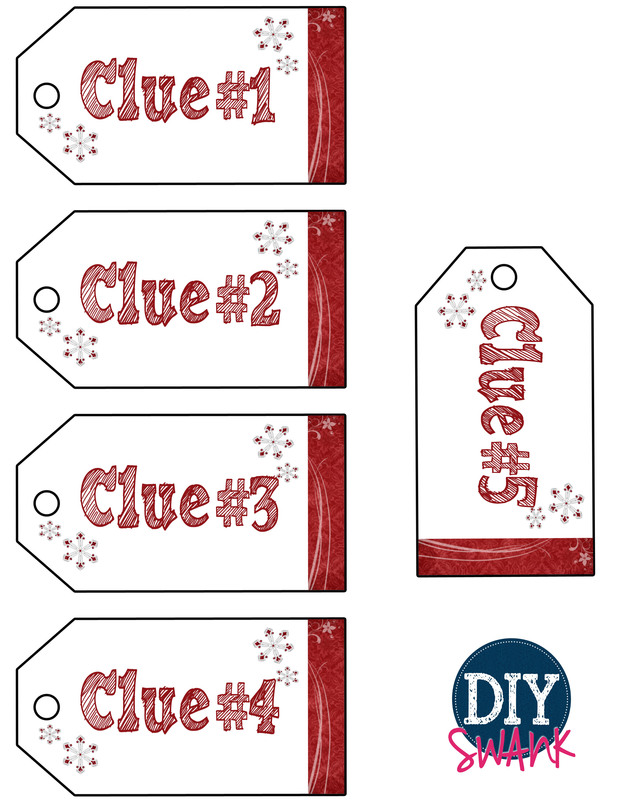 These are the tags for the clue envelopes. Santa can print them out and tape or glue to each envelope. Now here is where the $1 bills came into play. Santa put 100 of them in each box for the two big kids. The little guy wanted a pirate ship but he still got $25 so he didn’t feel left out. Santa took a cardboard box and cut the top off of it. 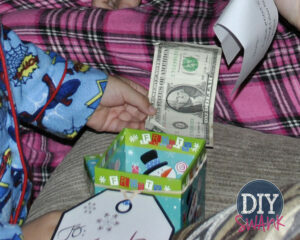 He put the 100 $1 bills in the box and then wrapped the box in wrapping paper. On the top where where the box top was cut open he put a sign that read “Punch here”. Then he put them in garage so that they found them after reading the last clue. 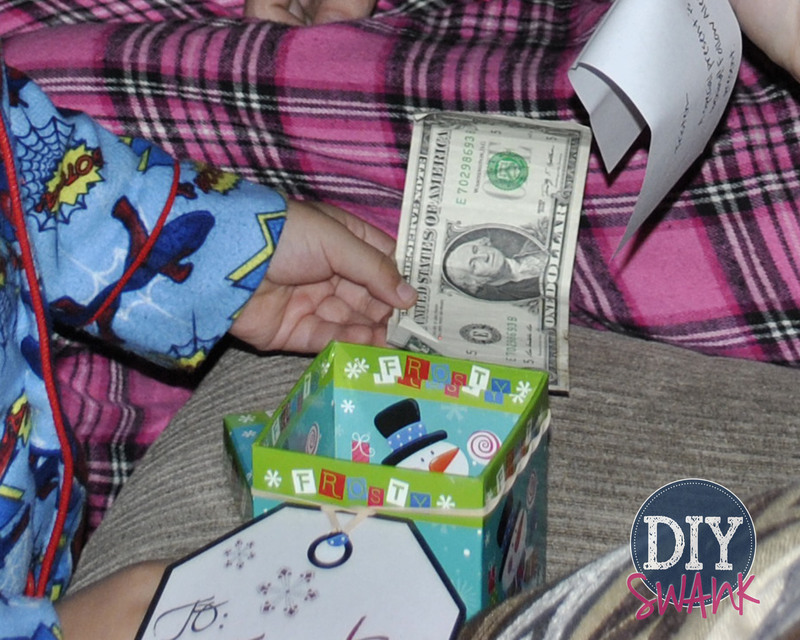 What a fantastic idea, in my post tomorrow, I’ve listed what my mini-men will be getting for Christmas…a job application and gas money – lol! Hopped over from BloggyMoms – Happy Holidays! I am so glad your family loved it. We didn’t do the scavenger hunt this year since it was our youngest first Christmas. My older two were a little bummed but I did do a special surprise for them that I will be sharing soon here on the blog! Merry Christmas! How old were your two oldests? Did they recieve any other presents that year or was it just the box from santa? I always did scavenger hunt woth younger siblings for their biggest birthday and biggest Christmas presents. My dad told me you hide it and give them clues cause you are more creative. Are family was different about santa so yeah. Only big present we didn’t hid was bikes that one Christmas cause how do you hide a bike. How did you make the clue tags? I love them, but i need 6! Thank you so much for the Santa tag. This is exactly what I was looking for. My husband and I have done treasure hunts for our 5 kids for Christmas Day going on 16 years now! They are so much fun! I love getting new ideas. This year we made a world on Minecraft and put clues in the game. We shall see tomorrow how it turns out. They are just so much fun! Two questions?? 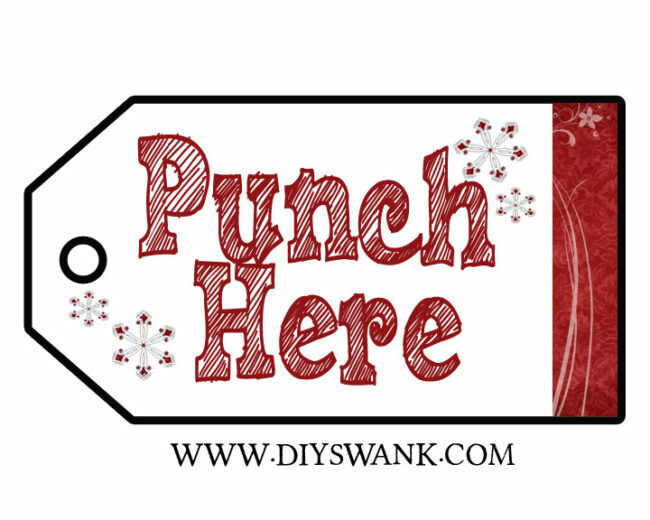 How do you add the name on the from Santa tag? Also, do you have tags with clues numbered 6-10? If not, how can I edit the clue tags? Thanks so much for the printables. The scavenger hunt was such a cute idea.